No matter where you are, it’s the best place to begin. 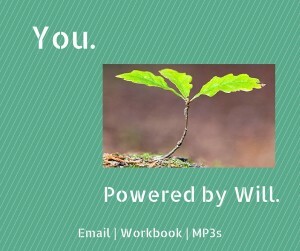 If you want to strengthen your power of will, start with whatever life is presenting to you now. One man has a particularly difficult job. He was recently given five weeks to complete a complex project. Because he is studying the power of will, he challenged himself to complete the task in three weeks. He set the intention for himself in his mind. Repeated it to himself over and over. As his conviction – that he could complete this challenge – grew in his mind he became more confident. And as he became more confident he found himself taking care of small details easier and with less confusion. Things as small as getting ready for the day, packing lunch and making sure all his supplies were available. He knows that all of these small tasks, taken together, can chew up a lot of the time available to complete a worthwhile goal. And as he was getting down to business quicker, and repeating to himself, over and over, “I will complete this task in three weeks,” his conviction grew even stronger. Before he started actually working on the project he took extra time to plan. He broke down the project into its component parts. Looked over the time that had been allotted for each component and thought how he could accomplish it faster, more efficiently and more accurately than he had done before. When he sat down to work on a single day, he had a plan to accomplish his tasks in an accelerated fashion. And because he is studying how to strengthen his power of will, he knows that all he can do – indeed the best thing he can do – is concentrate on that day’s work and nothing else. He has set up time delimited goals for each task so that the end result will match his intention. And when he finishes one task, and repeats to himself, “I will complete this project in three weeks,” he takes a breath and gets ready for the next task. And then he repeats the process, while repeating to himself, “I will complete this project in three weeks,” and completes that next task. He keeps at it through the whole day. Keeping track of his progress while repeating his willful intention to himself. And at the end of the first week, he found that he was ahead of even his accelerated schedule. After going home the first week he said to himself, “this process really works. And because part of thinking about his power of will includes taking stock of his success, he has grown even more confident. And as he kept repeating to himself, “I will complete this project in three weeks,” and took stock of how his intention was already working, he doubled down. The second week, he sharpened his planning. Was more precise about how he set up his tasks – and more energetic in completing them. At the end of that second week, he again took stock of his progress. He had finished more than 80% of the tasks. And as he repeated to himself, “I will complete this project in three weeks,” and felt even stronger about his ability, he set himself up for a strong finish. At the beginning of the third week he was on fire. He revised his intention – to not only finish, but to make it the best example of his work to date. Rather than coast, he knew he had time to go through the entire body of work from start to finish – and apply a “polish” that time had never previously allowed. At the end of the third week he told his supervisor the work was done. And because he had been using the power of will in an applied and focused manner, he was carrying himself with a quiet confidence. Because he had done more than improve his work performance, though that was a big source of satisfaction. He had proved to himself that he could awaken and strengthen his power of will. That his will was a real force inside of him that was the key to his success. And that his will could be strengthened with a series of focused challenges where each small success fed the next task – that he could create a self-sustaining momentum in his daily life, with just a little bit of attention. And with the project completed in record time, and his confidence soaring, he resolved to continue his journey in will development, one small, focused challenge at a time. 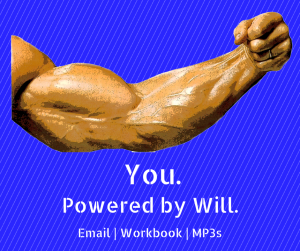 He will continue filling out the Power of Will workbook every day. He will continue reading the daily Power of Will emails. You can do the same for yourself. You can begin to develop your Power of Will by setting focused challenges, wherever you are, and creating your own ritual designed to propel you to accomplish many small tasks that will prove your own Power of Will to yourself. 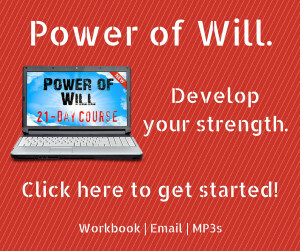 And if you would like to do that with the help of the Power of Will 21-Day Course, you can get instant access to the materials described in this message by clicking here, or by using the convenient button below. 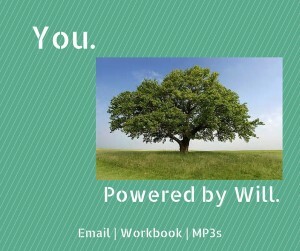 We hope you decide to strengthen your Power of Will.